In the first article in this series, we explored how the protesting unions in Wisconsin and elsewhere are yelling about a totally faulty premise: that there is some level of wealth that they "deserve." Nobody deserves any wealth at all; in a capitalist system, you are worth only what you can convince somebody else to pay you willingly. This creates obvious injustices such as the fact that Snooki makes vastly more than the Teacher of the Year. The only alternative to paying people what they can persuade others to pay them is a Communist command economy where you are paid whatever your betters think you should get and there's not much you can do about it. Nothing free about that, and as the Soviet Union demonstrated, it's economically disastrous. As Russian workers said, "We pretend to work and they pretend to pay us." Snooki's freedom to charge whatever the market will bear is a small price we pay for liberty and national wealth. The major reason to work is that there's some chance that a worker can become wealthy. The difficulty is that in order for anyone to get wealthy, or even to receive anything at all, the wealth has to come from somewhere - and that's what we'll explore in this article. 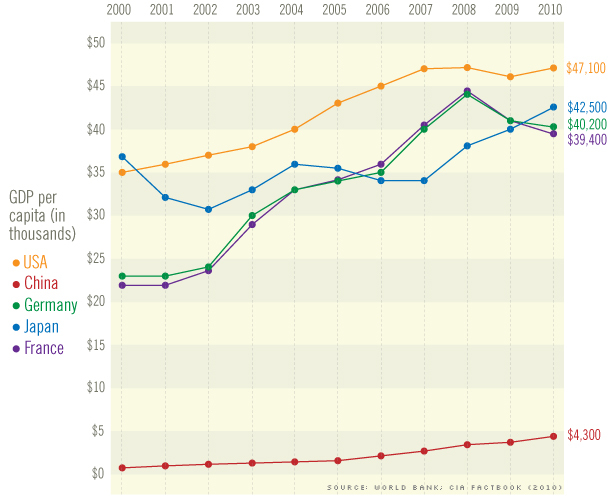 This graph shows the amount of national productivity, in dollars, per person in each country. Note that that is not the salary of each person or of each worker; it's simply the total national output, the Gross Domestic Product (GDP), divided by the population. On average, each American generates ten times as much wealth as each Chinese. If you look closely at the graph, you'll see that Chinese wealth has been growing enormously; it's at least tripled in the last ten years, but it started from a base pretty close to zero due to Mao's mismanagement of the Chinese economy. Average American production has increased too. In fact, in actual dollars it has increased by more than the Chinese, by about $12,000 as compared to maybe $3,000. We were vastly richer than they in the first place, however, so on a percentage basis, they've increased more. There are many reasons for this difference. As with the backhoe-driver who can dig in an hour what would take ten men a week with shovels, America simply has enormously more capital equipment than the Chinese. We have railroads, highways, factories full of equipment, airports, bridges, schools and universities of every description; until recently the Chinese pretty much had none of this. They're catching up astonishingly quickly, but they have an incredibly long way to go before the average Chinese person lives anything like as well as the average American. Long-term, on average, people cannot be paid more than the value they produce. Of course, every country contains people that don't work (economically) at all: housewives, schoolchildren, the retired, the disabled, the unemployed, welfare recipients, people in jail, and so on. We also all know people who have conned their bosses into a good paycheck despite being lazy shirkers. On average, however, no organization - no family, no company, no country - can receive or spend more than the wealth they produce. For many years, General Motors earned a great deal of money selling cars that people were willing to buy. Much of this money was spent on materials or in wages for the factory workers; more was invested in capital equipment like new factories. Even so, GM generated mammoth profits for shareholders for decades on end. One day it reported losses instead: new competitors offered better cars for less money, whereas GM's unions demanded ever more lavish compensation. Instead of profits, GM generated losses. Because of the great wealth earned by previous generations, GM didn't die immediately; it sold off assets and took loans from friendly banks. Eventually and inevitably, GM reached the end of the line; it would have gone bankrupt and closed in 2009 had it not been bailed out by your tax dollars for political reasons. If GM is ever to recover, every employee from the CEO down to the lowliest janitor must produce more value for the company than they receive in pay; that hasn't been the case for 20 years and it will be difficult for them to change such a longstanding mindset. GM ended 2010 in profit; they spent a portion of that profit, but not all of it, on employee bonuses. It's easy to know whether GM as a whole earned more money than it paid out: did it make a profit or not? It's harder to know whether each individual employee was worth their salary; how do you judge the individual contribution of one lineworker or janitor? There are actually a handful of jobs where it's simple to know exactly how much money one person made for the company; it's no coincidence that those jobs, like salesman or investment banker, tend to be very highly paid for the successful. Goldman Sachs knows to the penny exactly how much money they made on each deal put together by each banker that works there; so do the bankers, and they don't fail to point it out at their annual reviews. If you, personally, earned $100 million for your employer by sagacious stock trading, they'll pay you $10 million of it, after all waitresses get 15% and you're only asking for 10%. If your employer isn't willing to be that generous, you'll find a new one who is. Nobody will pay you the full $100 million, of course, so no matter how massive your paycheck, you will still be earning your employer an even more massive amount. Unfortunately, public-sector unions have a sordid history of demanding far more than they've ever produced, for years on end. How is this possible? That's the subject for the next article in this series. "Long-term, on average, people cannot be paid more than the value they produce." Unless you're paid by the government. Government employees, which the WI unions are, can be paid far more than they produce for decades without the ship ever being righted. GM is a private company and has to earn a profit. Scott Walker could just have easily proposed raising taxes instead of dumping the union. "Long-term, on average" the government can not pay out more than it takes in. Teachers, police men, ect can be seen as generating income for the government by inducing people to pay their taxes as they are receiving services from the government. You may believe that they are over paid however, as there is no direct way to measure their worth, that is opinion not a fact. You might argue that the government has the force of law to compel the paying of taxes. However, this only works so well for so long (as can be seen in places from Libya to Egypt and indeed in 1776 Philadelphia). The government provides invaluable services and while I may complain about how high the taxes are or where some of the money goes to that certainly does not change the absolute need for a not insignificant amount of the taxes that we pay. You're correct that the *entire* government cannot pay out more than it takes in, but that's not what I said. Original line was: "...people cannot be paid more than the value they produce"
Individual people - lots and lots of them, in fact - very much can be paid more than they produce because there are Protected Divisions within government that are never touched. Within those divisions, extra secretaries, managers, operatives, technicians, etc. can operate for their entire career doing next to nothing. These divisions are not just within departments or agencies you would have eliminated. You can find them within the military, for instance. I say this having seen it first-hand for almost thirty years. Private businesses have a vested interest in finding and eliminating their own waste. The government only cares about eliminating waste when citizens get riled up, and even then there is only so much auditing and investigation that can be done. I think the issue here is "long-term", combined with the generic use of "people." Yes, any one individual can indeed be paid more than their worth; they might get away with it through their entire career, and even be lucky enough to collect a lavish pension until they die in comfort. There are quite a few government employees in this happy state. Long-term, however, this isn't possible, and certainly not with "people" in general. Maryland demonstrated the principle in action: they jacked up rates on rich people, but would up with less money because the rich people bailed. If Democrat Senators can easily decamp to another state when Wisconsin gets too hot for them, so can rich folks. "There are quite a few government employees in this happy state"
Many dozens of thousands. Entire divisions. The voters really can't do anything about it that will be permanent. This is how governments works. They have no incentive to clean up waste, so things slide. We can get angry about it and make a few minor slashes here and there, but eventually it all slides right back. The difference between government and industry is 'proactive' versus 'reactive'. Industry must be proactive in eliminating waste. It thinks about what not to spend money on AHEAD OF TIME. Government only reacts to wasteful spending already-in-progress if the citizenry forces it to (which most of the time it doesn't). Look what it took for the Tea Party anger to boil over. Jacob is right - in government, people can be paid more than they produce if they latch onto the right position and maneuver their career properly. Happens all the time. "The voters really can't do anything about it that will be permanent." See, that's where I disagree. When something cannot continue, it doesn't. There are already examples of government employee pension checks simply stopping, because the government has run out of money to write them with - voter action not required. This IS what will happen to states and even the Federal government, if the bleeding isn't stopped. Yes, any individual employee may get lucky and die first. But it WILL end - it simply cannot go on long-term. With respect, Petrarch, you're continuing to misunderstand what I'm saying. You're taking my point about thousands of government employees and extending it to cover millions. It's not even a matter of the current status quo. Even if the authors of Scragged were able to reshape the US government exactly as they preferred, there would *still* be many thousands of government employees able to find underproducing, overpaid positions and ride them for decades. That is simply the nature of government work. I think perhaps you are underestimating the radical nature of Scragged's prescriptions for governance. Vast numbers of things the government is currently doing, it simply wouldn't anymore; most of the remainder would be provided via competitive-bid outsourcing or vouchers of some kind. The objective would be to provide competitive forces to the maximum possible extent. The obvious exception would be core public-safety jobs such as military, police, and fire. There, you are correct, it would be possible for government employees to insinuate into underproducing, overpaid positions. Way, way fewer of them though - and the point still remains, as a whole the entity must provide more in benefits than it costs. "people cannot be paid more than the value they produce"
"non-government people cannot be paid more than the value they produce, and government *agencies* cannot be paid more than the value they produce"
Yes, that would be more clear, and really is what I was getting at, "people" being plural. It is certainly the case that individual lucky people can manage to find a cushy job where they don't have to do much. Of course that also happens in giant companies too, and non-union positions - but generally management tries to keep it to a minimum.